L'Oréal Professionnel Tecni.Art Wild Stylers to create the perfect wild waves. Many of five products that allow you to get a flawless look soft to the touch. 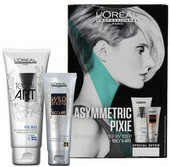 Products Wild Stylers meet the most demanding requirements of top stylists.